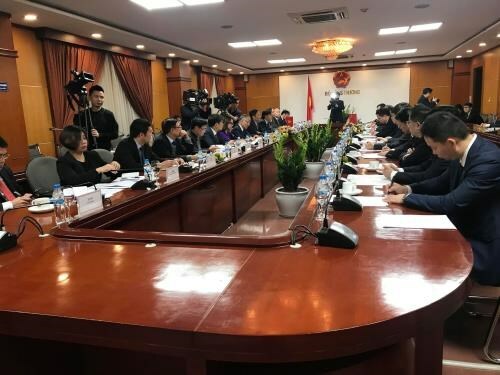 Hanoi (VNA) – The Vietnamese Ministry of Industry and Trade treasures cooperation with Guangxi and sees the Chinese locality as an important bridge to connect the Vietnamese and Chinese markets. Holding talk with Secretary of the Party Committee of Guangxi Zhuang Autonomous Region of China Lu Xinshe in Hanoi on March 20, Minister of Industry and Trade Tran Tuan Anh lauded Guangxi province’s role in developing Vietnam-China cooperation, particularly in economy and trade. He expressed his delight over the signing of a memorandum of understanding on enhancing collaboration between the ministry and Guangxi province in the presence of Prime Minister Nguyen Xuan Phuc. Anh took the occasion to ask Guangxi authorities to facilitate customs clearance for Vietnamese agricultural products and propose the General Administration of Customs of China to grant import permission for Vietnam’s passion fruit, mangosteen, durian and sweet patato. He said that the move will serve as foundation for companies from both sides to promote business ties. Lu, for his part, said that Vietnam and Guangxi hold huge potential to enhance land and sea transport connectivity, suggesting they develop transport infrastructure to facilitate trade. Describing the annual China-ASEAN Expo as a good opportunity for Vietnamese and Chinese enterprises to boost cooperation, he thanked the Vietnamese ministry for contributing to the success of the expo, and invited Anh to visit the Chinese locality and attend the 16th event scheduled in September. Vietnam has been the largest trade partner of Guangxi for years. Last year, two-way trade stood at 26.73 billion USD, up 7.96 percent year on year.